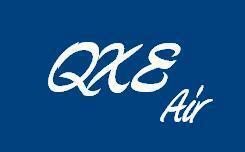 QXE Air is an airline led by Matthew Albright. QXE Air operates both a leasing division and a flight devision. QXE Air is currently the largest leaser of aircraft with a leasing fleet of 281 aircraft with 49 additional orders. QXE Air specializes in leasing narrowbody jets but also has an extensive fleet of widebodies as well. QXE Air operates out of both a traditional hub and spoke system as well as a point to point system across North America. This page was last modified on 15 May 2011, at 17:49.